A couple of years ago the Smithsonian Tropical Research Institute (STRI) published a “how to” guide to reforestation using native species in Panama in hardcover. They recently released the publication in digital form. This report summarizes the findings of STRI’s effort to identify commercially viable native timber species and increase adoption of these species among farmers and forestry project promoters. STRI researchers also released another paper that looks at mixed native species plantations’ growth rates for 5 species: yellow wood (Terminalia Amazonia), rosewood (Dalbergia Retusa), spiny cedar (Pachira Quinata), espave sp. (Anacardium Excelsum), and tropical oak (Tabebuia rosea). This paper is relevant to us because all 5 species are present in our plantations (the espave and tropical oak occur naturally). Interestingly, the study finds that each of the species yielded more biomass when planted together (mixed plantations) than when they were planted as monocultures. The yellow wood did best--something we’ve seen anecdotally in PE’s plantations. We were happy to see that for the most part our plantations implemented all of the best practice guidance now catalogued in this new guide. Panama, and especially the Darién, desperately need more native species restoration, so we are pleased about these two new resources. All of the species Planting Empowerment planted in our mixed native species plantations are considered in one or both of these resources, and we will continue to measure our plantations and share the results so that others can learn from our experience. Our operations are open to the public, so if you’re ever going to be in Panama or visiting the Darien, just send us a note and we can arrange for a tour. Decomissioned cocobolo logs in the Azuero province of Panama. Photo courtesy of La Prensa. Rosewood was in the news recently because new export laws have been impacting the transportation and export of music instruments containing rosewood components. 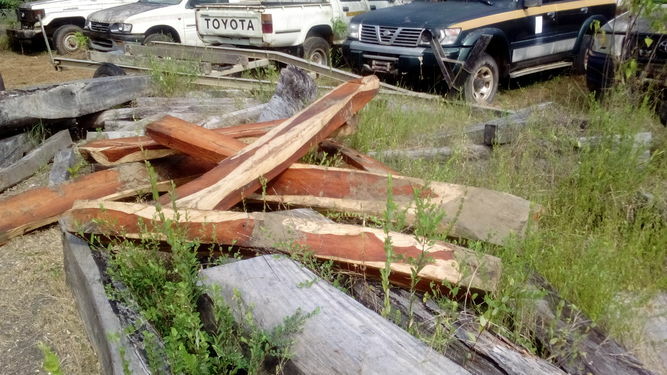 About a week later, we read in the Panamanian newspaper La Prensa that the Ministry of Environment busted a truckload of illegal rosewood--or “cocobolo”--in the Azuero province of Panama. As in Panama, globally the illegal harvesting of cocobolo continues to be a problem as Asian demand (mostly China) for furniture made from it continues unabated. In Panama and at least in the Darien, the rosewood “fever” that occurred during 2014-2015 seemed to have dissipated, but that also could be because most of the easy to get rosewood has been cut. It has been awhile since we’ve heard stories of roots of rosewood trees being dug up to make sure they get every last piece. It was being sold by the pound during that time. Our fincas include cocobolo among other tropical hardwoods. Our anecdotal experience is that the rosewood trees thrive in our mix of native species. What we don’t know is if the tree will be mature enough to have developed “rose” colored heartwood by the end of the 25-year lease cycle. However, if they have not developed heartwood, we can leave them to grow and our local partners will be able to benefit from them in the future. The benefit of growing trees is that they only increase in value the older and larger they grow. While we hope the illegal harvesting of these beautiful trees is stopped, there should be a place for the use of the beautiful wood in the instruments recently profiled. We want our farms to be a source of legal and sustainable cocobolo for those instruments. In only about 12 more years we should know if we will be able to. We will keep you posted.